Actually, keeping your hose safe from burglaries and thieves is really more about keeping your “stuff” safe. And that’s where most people come up short in their preparation against such possibilities. The Safety and Security of your house and your “stuff” doesn’t start at your front door as most would assume. It starts at your mailbox and ends in your garbage can. What I’m going to do is divide home security into two halves. First, what you can do outside of your house to keep it safe and second, what you can do inside your house to keep it safe. So always bear in mind when you are “hardening” your home against burglary or robberies that if you only address half of your security needs that you will have left a wide open door for a criminal to walk right through the other half. 1. Get a locking mailbox. You can buy the best lock and the strongest door for your house to keep a thief from getting in and taking your T.V. and some jewelry, but what does that matter when a bad guy can casually walk up to your mailbox, flip open the lid, steal your bank account information and then wipe out your entire life savings? Secure your mailbox. I know it’s a hassle to get a key just to go get the daily mail but the alternative can destroy everything you’ve ever worked for. And the thief would never even get his fingernails dirty. There are plenty of options for locking mailboxes and even locking inserts that can be bolted into existing boxes. 2. Shred all of your vital information including hotel key cards and credit cards before putting them in the trash. You could always burn them if you’ve got a fireplace. Or, get a shredder – they’re cheap – especially if you think about the consequences. Yeah, I know this is a “hassle” too, but think about it. Are you going to let “being lazy” be the reason you lose your house, your job, and all your savings? In the case of vital information about your banking and credit an “ounce of prevention is worth a thousand pounds of cure.” And since I’m using cliché’s “Don’t be penny-wise and pound foolish.” If a thief can clean you out by taking some papers out of your trash, he doesn’t need to break into your house. 3. Physically destroy all hard drives on any computers you are getting rid of. A good computer nerd can get all kinds (virtually all) the info that has been loaded onto your hard drive. Grab a Philips head screwdriver and take the time to take the cover off the computer, remove the hard drive, or solid state drive and smash it to pieces with a hammer (wear safety glasses). When you expose the disc (the important part) beat the hell out of it, and drive some nails through it to render it unrecoverable. If it’s a solid state drive just beat it to a bunch of little pieces. 4. Get to know your neighbors. They are your first line of defense. They don’t have to be your best friends but that wouldn’t hurt. And I don’t mean just your next door neighbors but several houses down on each side – if you feel that they are “squared away,” decent folks, trade all your contact information with them and ask if they’ll watch your house when you’re away. Not just when you’re on a vacation or at work, but all of the time. And of course offer to return the favor. Be sure to tell them not to be bashful and if they see anyone lurking around the house, to call the police immediately. Since most people are reluctant to call the cops over something that doesn’t appear to be an emergency, affirm to them that it’s okay to call the police and it only matters to bad guys if the cops show up. The house keeper won’t get hauled off to jail. Coach them to take pictures of anything suspicious. Tell them you’ll be just as vigilant about their property. And keep your promise. 5. Never tell anyone about your “stuff.” And never show anything off to anyone unless you want to lose your “stuff.” You don’t want people to know you collect coins, stamps, baseball cards, firearms or anything else for that matter. You can’t let anyone outside of your immediate family know about it. And then swear them to secrecy. Stress this to your kids. A friend of mine once told me, “It’s simple Ernie. If you want to keep a secret, don’t tell anyone” If you ever have anyone in your house to do work, hide or secure everything. A huge percentage of robberies are committed by workers or their friends who return to steal your wife’s jewelry and your Mickey Mantle rookie card. 6. Get a dog. A big, barky dog that you can train to stay in the house while you are away. I’ve got a pretty big dog and I’ll tell you that when he’s on the other side of my front door barking, he sounds like a 200 lb wolf and I guarantee you that any would be burglar would not challenge his presence. Also, burglars don’t like noise. It does things like make those new friends, your neighbors, come out to see what’s going on. And of course, you can also count on that dog to defend you and your family when you are at home, sleeping at 2:00 AM and someone breaks a window and tries to get in. 7. Get an alarm system. Even if you have a dog, get an alarm system anyway. The alarm will notify the authorities if someone penetrates the perimeter when it’s armed and you are away. And like a dog, it too is loud. When I test my alarm, the sound outside would wake everyone for two city blocks. The sound of the alarm inside the house seems like it’s piercing your brain. Unless the thieves are wearing noise canceling headphones they won’t be able to stand the ear splitting siren long enough to take very much. I use ADT but there are a lot of companies out there and a lot of options. If you can, talk to some cops about what they recommend you get. 8. Get a safe. Make sure it’s heavy and bolts to the floor. Make sure it’s so heavy that it takes 2 people to move, even with a dolly. Fire proof safes are best but they can get pretty pricey. I’ll leave that choice up to you. Keep your most important and valuable “stuff” in the safe. Don’t display your safe in your living room. I know, the nice ones are really beautiful but keep it in a closet or somewhere where no one will know you even have a safe. If by chance some bad guys find out you have a safe, they just might decide to pay you a visit to get all the gold, cash, and diamonds they “know” you’ve got stashed in your safe. Most safes are hard to open even with tools, so it’s still the best way to keep your “stuff” even if someone does gain entry to your house. 9. Make copies of your most valuable documents and store them off site. Of course the best place is a safety deposit box. Most banks have a nominal charge if you have an account there and some offer a safety deposit box for free if you have a minimum dollar amount in an account there. If there is no safety deposit box option, then store the copies at your son or daughter’s house or even a storage unit that can be rented. You can always hire a lawyer to keep them safe. Valuable documents would include copies of your passports, I.D.’s, insurance, mortgage papers and any other personal or sentimental documents, such as marriage licenses, photos or family documents that you never want to lose. Perhaps you should consider storing “special” original documents offsite if they are that important. Of course any important documents that you keep at home should be stored in a fireproof safe that is of course bolted to the floor in a nondescript closet corner. 10. Get a Camera Surveillance System. Cameras do not physically stop someone from entering your house but they can be a strong deterrent to most burglars. Mount your cameras high, on all the corners of your house so they can cover all sides and can’t be easily tampered with or disabled. You should always have at least two cameras dedicated to the front entrance to your house, one looking out towards the street and one looking at the front door. However I recommend three cameras. Two like I just described and one dummy (fake camera). The trick is to hide the two real cameras and mount the fake camera in an obvious spot (one that can’t be missed). In most cases the bad guy (s) will see the obvious camera and if they “disable” it, they won’t even look for any others, leaving your system intact to record their ugly mugs and if you’re lucky, a license plate. There are so many camera systems out there I’m not even going to recommend one. Do your own research on that. The system at my house has 16 cameras and I can operate it remotely from my phone or any offsite computer with internet access. So you see, home security encompasses a lot more than with just putting a big lock on your front door. True security involves a realistic viewpoint of well, reality. And the reality is, like I said earlier, if someone really wants to break into your house they probably can. I was trained to prepare for all possibilities and have a contingency or countermeasure in place for as many of those probabilities as possible. These 10 will go a long way in helping you to protect your “stuff”. In the future we will talk about how to keep bad guys out of your house and how to keep you and your family safe if the barbarians ever do storm your gates. 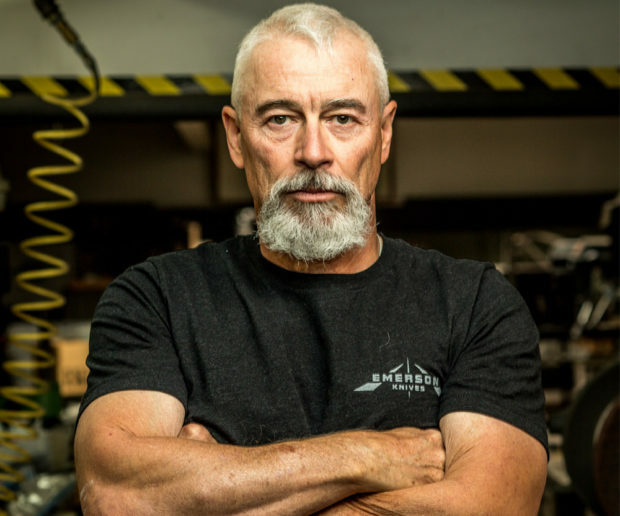 Ernest Emerson is the owner of Emerson Knives, Inc. He is a tier one Combatives instructor, Master at Arms, noted author and lecturer, Black Belt Hall of Fame member and a connoisseur of fine whiskey. Click here to visit EmersonKnives.com. Mr. Emerson offers a 10% discount on his knives to Daily Caller readers. Use the discount code – tdc (all lower case). Click here to visit the Emerson Training Center.